Centralia is a former British commonwealth Air training Program airfield that was used during the second world war to train pilots to fly and particularly bomber pilots since it was close enough to Lake Huron to use as a practice bombing run target. It's quite a large airfield with the classic triangle layout and original WW2 hangars now converted to private businesses. Glenn Latour is the resident AME who always has time for a chat with any of the pilots who happen to pop into his workshop there. On the other end of the field is a one-stop-shop for aircraft retrofits which has over the past several years gained quite a reputation for doing some very nice work-I'm told they even retain a full-time carpenter for interior remodelling of some higher-end business jets. There's almost always some interesting aircraft to be seen at their end of the field (actually, they own the whole field). Otherwise, the field seems very desolate most of the time with only very light sport traffic in and out of the field despite it's long runways and long-ago decommissioned control tower. Nonetheless, it's a great place to stop to refuel or stretch the legs. Glenn's shop is just outside of the frame to the right. Centralia airport from the southeast and about 6000 ft. The houses adjacent to the field are the former quarters of the pilots and officers who used to fly there. Another jet getting refurbished at Centralia. My RV-4 in foreground. 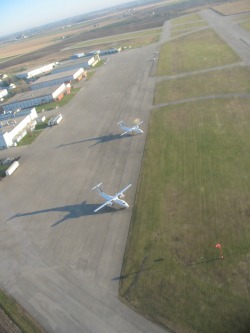 So, I was flying my RV one morning and overheard a lot of air traffic at Centralia airport and knowing it's normally much quieter there, changed course to see what was going on. I was pleasantly surprised on landing to find that there was a fly-in breakfast going on at Glenn's Terryair. It turns out that Captain Chris Hadfield had flown in along with his brother and dad both of whom also fly. The opportunity to sit and chat with a Canadian hero was too great to pass up so I grabbed a seat at Mr Hadfield's table and soaked up the stories of space travel and his impressive ability to chat up just about anyone. His dad and brother were equally approachable, and it's no surprise that their family has been so well-received as true Canadian emmissaries- they're just really friendly and humble people despite the fact that their personal achievements are beyond most Canadians experience. 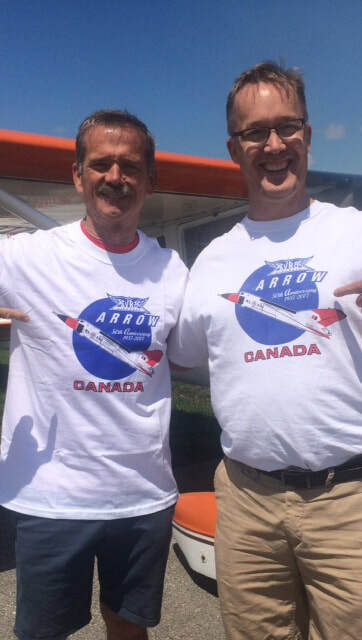 I had some of my Arrow T-shirts in the back of my plane that I usually save for friendly airport managers and student pilots I happen across, so the opportunity to present one to a Canadian icon was not one I could pass up. Of course, Chris was kind enough to suggest we pose together with the T-shirt, which I was only too glad to do!